After one step update, I get error message saying Errors during Quicken Cloud Sync. Any ideas on how to clear the Quicken Cloud Sync error? To clear the error, you need to perform a successful Quicken Cloud sync. After you have performed a successful sync, you should be able to disable further Quicken Cloud syncs by selecting Edit > Preferences..., Quicken ID, Sync & Alerts, Sign in as a different user, and sign in with your same Quicken ID and Quicken ID password. When prompted, choose Do Not Use Mobile. How do I sign in as a different user? I only have 1 Quicken account -- should I make a 2nd account? if so, would I then be able to use the same Quicken install on my computer? I did try to sign out and then back in as suggested by Quicken Sarah in a different post on same subject (but now closed). She just said to sign out then sign back in. I also closed Quicken, rebooted Windows and launched Quicken. Quicken then made me sign back in before it would launch (load). But that didn't work, as when I signed back in and did a sync, but still had error. Maybe clearing the Cloud Sync error will also make my Online Bills reappear? When you sign back in, you should use the same Quicken ID and Quicken ID password you used previously. You do not need another account. I've signed out and signed back in several times last week, will try again. Wish me luck! But did you perform a successful Quicken Cloud sync first? To clear the error, you need to perform a successful Quicken Cloud sync. After you have performed a successful Quicken Cloud sync, you should be able to disable further Quicken Cloud syncs by selecting Edit > Preferences..., Quicken ID, Sync & Alerts, and Sign in as a different user. 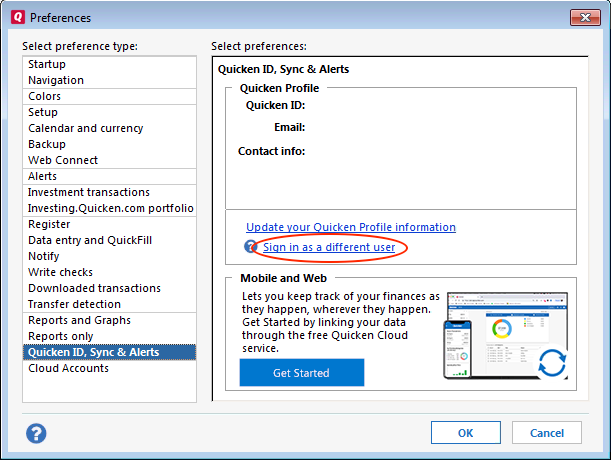 When prompted, sign in using your Quicken ID and Quicken ID password and choose Do Not Use Mobile. To clear the error, you need to perform a successful Quicken Cloud sync. OK,thanks for the response -- that was really my original question that I'm seeking advice.... How do I perform a successful Quicken Cloud sync in the first place? I can't recall when I've ever had a green dot next to this activity in my summary and I've finally decided to try to get rid of it. so it seems like a Catch-22 situation? This is something I have posted previously ... maybe it'll help you. Under the "Mobile and Web" group to the right, if present, click the "Reset your cloud data" link and follow the instructions until it is complete. Click the "Sign in as a different user" link immediately above the "Mobile and Web" group. Sign out, then sign back in to your Quicken account using your current (correct) Quicken ID, but on the following screen make sure you select the "Don't use mobile" option and move through the remainder of the process. 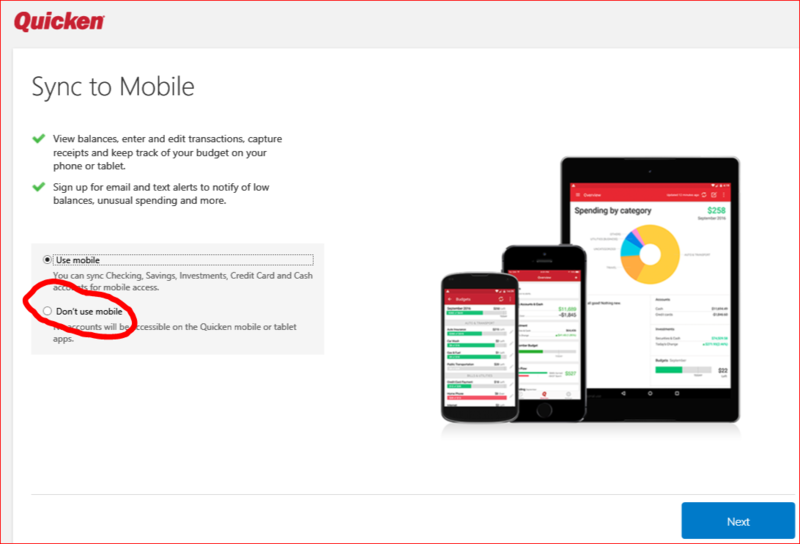 If you haven't already, you may want to review: https://www.quicken.com/support/how-set-and-sync-accounts-quicken-your-mobile-device. I suggest attempting to only sync a dummy cash account created for this purpose. Once this dummy account has been sucessfully sync'd, I suggest you proceed to disable Quicken Cloud sync as described earlier and delete the dummy account. Today when I went into Preferences, I had an option to reset under the "Quicken ID, Mobile & Alerts" section. It was not there previously (I swear). I clicked on that and after a bit of circle spinning, got an error message, then closed and then restarted Quicken. When I synced my accounts, I did not get the error message. Not sure what worked, but fingers crossed, it will stay clear. For the records, I don't use the Mobile App and don't plan on using. 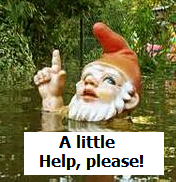 Also don't use the Cloud account (that I am aware) and don't think I sync any accounts online and don't need to access any of my records online, quite happy to access locally from my laptop or desktop. Now how do I mark this thread as answered or solved? A moderator will take care of that for you. Glad to hear that your issue is resolved. Remember to select "Don't use mobile" if you ever have to logon to your Quicken ID or register a data file or the whole nightmare will start all over again.